You may be seeing a lot of blue lights shining this month, people wearing blue, people wearing puzzle piece pins, people decorating their homes and businesses - all to help increase awareness of autism. Why all the attention on this disorder? Because the new numbers from the CDC show 1 in 68 kids now being diagnosed. We all need to be aware of this disorder because these kids will be grownups someday. Autism affects, or will affect EVERYONE on earth in some way. 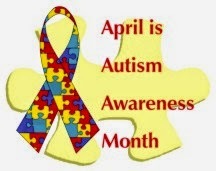 If you don't know much about autism, please look it up or ask questions about it. My husband and I would be happy to answer any questions regarding our daughter.